Harriers are smaller than foxhounds but bigger than Beagles. These scent hounds are active with a high need for exercise and are ideal for joggers. 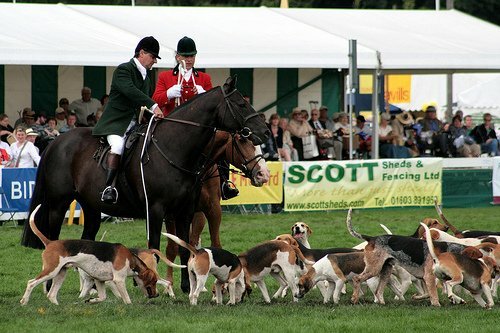 A smaller version of the English foxhound, the Harrier was developed in England and used to hunt hares (rabbits). This hard-working breed can work on any terrain, and it possesses great stamina. The nose is black, and the medium-sized ears are wide, long, and either hazel or brown. The tail is high, and the short, fine coat is usually multicolored with shades of white, red, lemon or tan. The average height of a Harrier ranges between 18 and 22 inches, and the weight vary from 40 to 65 pounds. The average life expectancy is 12 to 15 years. There are conflicting theories about the origin of the Harrier dog breed. Hunting hares dates to 400 BC, but there is no evidence of a Harrier being present at that time. The first Harriers were recorded in England in 1260 AD. A pack of dogs called the Penistone were owned by Sir Elias de Midhope. The breed was popular for its excellent sense of smell, stamina and slower hunting speed — which allowed hunters to follow the dogs on foot much easier than other hunting breeds and hounds. The Harrier is believed to have been bred down in size from the foxhound, although conclusive proof is lacking. The Harrier’s and foxhound’s appearances are the same except for size; the Harrier is smaller than the foxhound but larger than the Beagle. Harriers have been noted in the United States since colonial times; the American Kennel Club recognized the breed in 1885. Harriers are hare hunters and companion pets and may also participate in conformation, tracking and agility. Harriers were bred to follow scents over long distances, and their hunting instincts are strong. They are used to being around other dogs or working in packs and may suffer from separation anxiety of become destructive if left alone for long periods of time. People who are away at work all day may find it best to have two Harriers so they can keep each other company. The Harrier is a scent hound and will follow its nose, so a fenced yard is a must. Harriers like to dig, so the fence must be secured where it meets the ground, by chicken wire or other means. A sandbox or other digging area should be provided — you can train your dog to use these areas. Harriers cannot be left in the yard as outside-only dogs; they have a strong pack mentality and are very social and people-oriented. They prefer to be around their family and other dogs. They will require training, but they are intelligent and learn quickly. The breed is known to be quite talkative and has a distinctive howl. The noise they make can vary depending on each individual dog, but they can be trained to be quiet. Harriers get along well with other dogs and children. They should be supervised around non-canine animals because of their strong hunting instincts. Harriers have strong hunting instincts. Like other dogs with jobs to do, they need daily exercise. Rigorous walks or jogging will help them expel energy. Outdoors, they must be kept on a leash or inside a secured perimeter to prevent them from running off to follow a scent. Even a well-trained Harrier can ignore a return command in favor of tracking the origin of the smell. Harriers are moderately active indoors but not enough to satisfy their exercise needs. They are not recommended for apartment life unless the owners are active and can commit to daily outings of jogging or hiking. Harrier hounds can walk and run upwards of 20 to 40 miles when hunting, and it would be difficult for a human to keep up with such a demanding distance. One Harrier owner in upstate New York was faced with the challenge of finding a way to exercise his dog. He found a solution in using a golf cart to keep up with the dog when she was running on a lead. The short coat makes grooming easy with this breed. A regular brushing will help remove dead hair. Working Harriers should have their paws and ears checked regularly, especially after returning from a hunt or wooded area. The nails may not become worn down even with outdoor work, so they should be trimmed as needed. Brushing the Harrier’s teeth is recommended to maintain good oral hygiene. Eye problems are minimal in this breed, but annual testing is recommended through the Canine Eye Registration Foundation. Harriers love to eat, and they will eat as much as you give them. Portion control is important in order to prevent obesity. If you are unsure of how much to feed your dog, check with your veterinarian for guidelines and suggestions. Annual veterinary visits are recommended to monitor the dog’s weight as well as check for eye problems and other health issues. Is the Harrier the Right Dog for You? If you are looking for a lap dog or one that needs only a walk around the block twice a day, this is not the breed for you. Harriers are active scent hounds with a high need for exercise. The ideal owner will be a jogger, hiker or someone willing to go on long, brisk walks so the dog can expel energy. Harriers need to be on leads or in enclosed areas at all times to prevent them from running off after a scent. Harriers are great dogs for active families and enjoy children. If you have a cat or other non-canine pet, supervision is a must. Grooming is minimal, and so are potential health problems. Harriers are not outside-only dogs and can suffer from separation anxiety if left alone for long periods of time. If you can provide the active lifestyle this breed needs, a Harrier might be right for you. Harriers are not as common in the United States as in England, so finding one here can be a challenge. Please check our adoptable dog search first to see if one is available. If you’re contacting breeders, be aware of puppy mill warning signs and ask for proof of medical testing on the parents for the common health problems, especially eye testing. Although eye problems are not common in the breed, testing is highly recommended.